The Chesterfield area in Virginia has become an increasingly attractive location for both families and professionals who want to live in a more friendly and secluded environment that’s still convenient to the city. 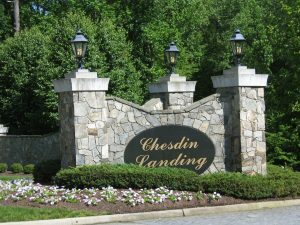 There are many communities in Chesterfield, but one of the most sought after is Chesdin Landing. This is in part due to the community’s proximity to Lake Chesdin and the availability of waterfront lots. The view from your home can have a big impact on your state of mind, which means that being able to enjoy stunning views of the lake and the surrounding woods throughout the year can only increase the enjoyment of your home. One of the reasons people move to the Chesterfield area, in general, is to get away from the hustle and bustle of the city. A home by Lake Chesdin will make your life even more relaxing. The presence of water has been psychologically associated with helping to create a state of relaxation. That means it will be easier to live a low-stress life by living in Chesdin Landing. Plus, our lots by the lake are by no means small, so you’ll enjoy plenty of privacy. If you enjoy any kind of water-related activity, whether it’s swimming, boating or fishing, you’ll love having such easy access to Lake Chesdin throughout the year. Most people who enjoy spending time out on the water have to travel a fair distance to be able to do so, which means they have to plan their day around it. By living in Chesdin Landing, you’ll have easy access, whether the lake is right there in your backyard or you can reach it via a short walk or bike ride. If you’re raising a family or often host your family, you’ll want to make sure the area is safe. The Chesdin Landing community is extremely family-friendly, which means there are few safer places that you can live. In fact, most of the Chesterfield area is considered to be very safe. The community is quite friendly as well, and neighbors tend to engage with one another. This is encouraged more by the many community events that are held throughout the year at Chesdin Landing. Even though the proximity to the lake will make you feel like you’re living out in nature, there are many conveniences, such as restaurants, banks, gas stations, grocery stores and schools, that are within a short driving distance of the community. Unlike other planned communities, the homes in Chesdin Landing are not carbon copies of one another. The homes built in Chesdin Landing are built to fit the unique needs and personal tastes of their owners, which means the community actually has a lot of personality when it comes to the type of houses that have been – and continue to be – built here. There are a lot of factors to consider before you buy a home or a lot to build on. Besides making sure your home meets all of your personal needs, from comfort to convenience, you’ll want to make sure it’s a good financial investment. You don’t want to end up with a house that you’ll only be able to sell at a loss. Fortunately, this is not the case with Lake Chesdin homes. The homes in Chesdin Landing retain and grow in value. This is because of the benefits previously listed. It’s also because waterfront homes aren’t widely available. There are only so many lakes to build on and they are extremely desirable. These are just some of the benefits that homeowners living on Lake Chesdin enjoy and that you can enjoy as well if you decide to invest in property in Chesdin Landing. For more information about the land available near Lake Chesdin or about our community in general, be sure to contact us at Chesdin Landing today.